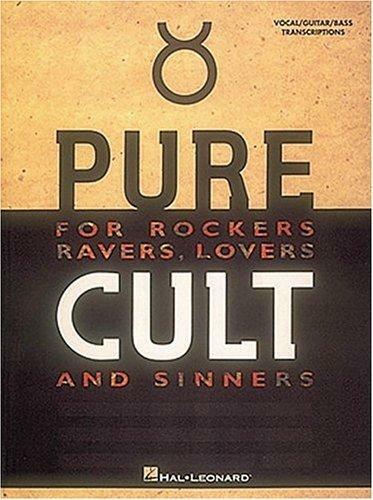 CULT, PURE. For Rockers, Ravers, Lovers, and Sinners Per Chitarra TABLATURE e Basso. Transcriptions for guitar, bass, and vocals of 18 Cult classics, including: She Sells Sanctuary * Fire Woman * Spiritwalker * Love Removal Machine * Wildflower * Sun King * and more. Also includes photos and a bio of the band. seem to sum up the band succinctly as ever. decade that has meant anything! charted is unique and ... well, 'Legendary'. by many infinitely less tuned in! helm. It didn't come out sounding like A.O.R! proclaimed that Rock was dead! the music says it all. something special, to the best! interesting bit, not the arrival! Cult for you; a promise for the future! All compositions by Ian Astbury and Billy Duffy.